The HydroActive waterproof headphones has a cool wrap-around design. It is easy to wear, ideal for swimming, canoeing, surfing, kayaking. The extreme waterproof multiple protection chamber earphone works with 3.5mm headphone jack. HydroActive are watertight with un-muffled clear sound quality with one year warranty. They are regarded as the best sweat proof earphones. However could consist a choke hazard and not ideal for children under 3 years. Product is HydroActive earphones, patent design is warp-around. The ruggedly designed product provides a secure fit, unique funnel shape, improved sound quality. The two chambered earpiece is effective in keeping water out and sound in. You get 4 styles with 11 different earbuds to fit different sized ears. Enjoy interchangeable eartips from swimming earbuds, hydroActive or Flex. Constructed with heavy duty plastic, reinforced wires and synthetic fiber they are very durable. They are compatible with iPod, devices that use 3.5mm jack, DELPIN and SYRYN. 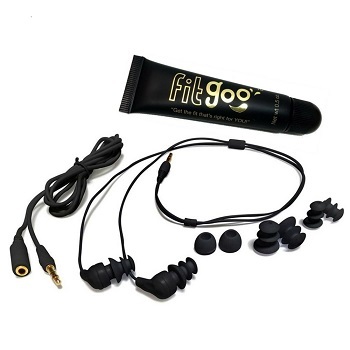 The earbud style are ergo tips for personalized fit, tree tips to block sound completely. Others are fin tips for more flexibility and comfort, round tips for casual usage. The product is HydroActive Short-Cord Waterproof Headphones. Headphone fit in-ear, item weight 6.4 ounces, manufacturer Underwater Audio. With this product you get a waterproof iPod shuffle case and earphone in one awesome package. The connectivity is wired while the ergonomic design fits the ear canal. Enjoy superior sound quality, easy use and comfort. The iPod shuffle case is lightweight, easy to use with aligned waterproof iPod buttons. This makes controlling the volume easily assessable including a 1 year warranty. This product is especially manufactured for swimmers. It features conventional controls, personalized fit and powered by H2O audio technology. You get X-1 interval 4G waterproof headphone, waterproof iPod shuffle case. Superior construction accommodates depths up to 12ft/3.6m. Others are hydrodynamic design, improved bass amplified sound and 100% waterproof. The first thing you notice about Plantronics BackBeat is the unusual design. They are made for maximum comfort and fit during vigorous exercise. It has one-ear controls to regulate music and answer calls. The earphone is waterproof/swim proof because of the flexible design and P2i nano-coating. The device meets IP57 rating for durability and ability to withstand fresh water up to 1 meter for 30 minutes. You will enjoy the customized codec deliver, powerful bass, crisp clarity. At full charge you will enjoy eight hours listening pleasure. The quick charge technology adds an extra hour for a fifteen minute charge. Plantronics BackBeat has wireless updates with latest firmware delivered directly to headphones. The product is Plantronics BackBeat FIT wireless bluetooth headphones. It has bold energized colors, waterproof and sweat proof. Others are free companion app, easy-access control. Item weight is 0.8 ounces, headphone fit on-ear, and additional features stereo, microphone. The sound quality is good but they do allow some ambient noise. Plantronics BackBeat is the ultimate workout partner. The flexible durable design has no wires with an effective backbeat fit. Immerse yourself in powerful bass while swimming or exercising. Enjoy engaging audio, stability, and comfort up to eight hours playtime. It is sweat resistant, waterproof, unstoppable ware. 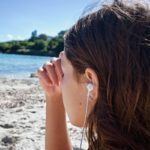 This headphones are 100% waterproof, comfortable and easy to use. You will love the superior sound quality produced from the high quality internal sound technology. On the surface, on the water or underwater you will enjoy the premium bass presentation. The stereo earphones can withstand rain, heavy sweating or perspiration. Surge S+ has IPX8 rating and complete submersion to 12feet. The product has ergonomic sheared shape that fits comfortably in your ear canal. It has H2O audio waterproof surge sport-wrap. Perfect for paddle boating, surfing, swimming, hiking, biking, running and comes with 1 year warranty. 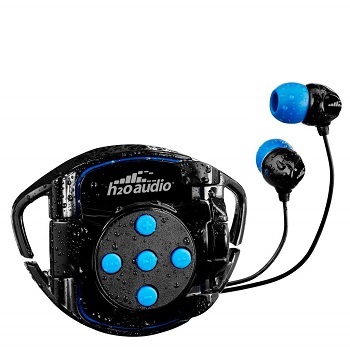 We love the H2O audio advanced waterproof technology perfect for swimming, exercise and surfing. Specifically designed for underwater use it is 100% waterproof. We loved the improved bass amplified sound. Other features are sound isolation, watertight earplugs, and improved bass technology. Because they are designed for water they have secure fit, underwater audio engineering, full line of headphones and accessories. The item is Waterproof Headphones for Swimming – Surge S+ (Short Cord). Headphone fit in-ear, item weight 0.9 with short cord. The fit is so secure you might find them difficult to extract. They are sweatproof, waterproof have hydrodynamic design and custom earplugs. Swimbuds sports have a short 40cm cord, rugged construction. The wired earbuds work with 3.5mm jack. 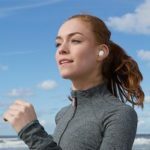 They have included different style interchangeable earbuds for more comfortable fit. The different ear tips are fin tip, tree tips, ergo tips, round or mushroom tips. Mushroom tips have conventional size perfect for casual listening. 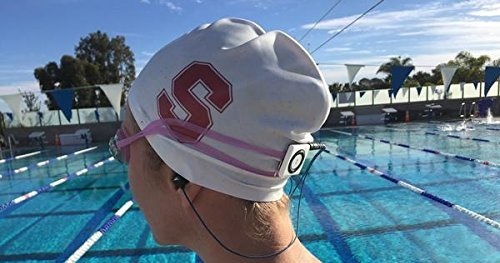 The ergo tips fit perfectly under swim cap while fin tips accommodate watertight seal. Tree tips keep water out perfect for aquatic athletes. Product is Swimbuds SPORT Waterproof Headphones (Wired 3.5 mm Jack).headphone fit in-ear, additional features waterproof. Item weight is 4.8 ounces. The ANBES headphones uses bluetooth technology and has IPX7 waterproof in-ear earphone. The sporty headphones has noise cancelling, high definition stereo, mic and ear hooks. It is wireless has flexible ergonomic design, anti-fall characteristics. The device is ideal for different sports activity like jogging, running, climbing, and hiking. The IPX7 waterproof protection is effective to 3.3 feet. You get 8 hours talk time, 100mAh battery with 250 hours standby time including BIB, rohs, CE, FCC certification. 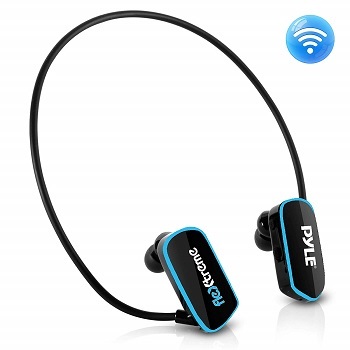 Uses bluetooth 4.1+ Edr and csr chip including noise cancelling. Others are HD stereo sound, 100mAh battery, IPX7 waterproof protection. 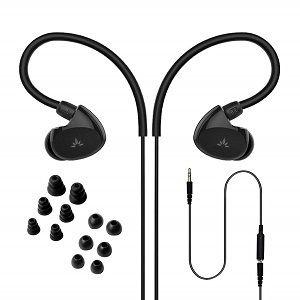 It has ergonomic design, in-ear headphone with a microphone. Complete with comfortable ear hooks, 8 hours’ work time. Place earhooks over back of ear then insert the earbud into the ear canal. Adjust it to fit then use cord clip to close fitting. 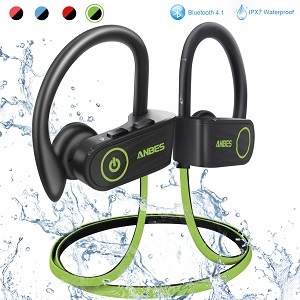 The product is ANBES bluetooth headphones wireless earbuds. The bluetooth version V4.1, work time 8 hours charging time 1.5 hours. Wireless range up to 33 feet, built in microphone, CVC 6.0 noise cancelling and waterproof level IPX 7. Item weight 0.64 ounces, battery type lithium polymer batteries. The Avantree TR508 secure fit is a swimming earphone. It has a short cord and 6 pairs of soft earbud tips. The device is ideal for swimming, running, hiking, diving and surfing. The earphone does not have bluetooth technology or audiophile grade in-ear monitors. The sound is well balanced good highs, moderate bass. The eartips choice also affects the amount of bass that comes through. The locked-in ear hook design is secure, perfect for swimming. The manufacturers offer different shapes and sizes for any ear type. The earbuds are waterproof and will sit comfortably in your ear. The cord is short ideal for swimming, does not get in the way and allows free hand movement. The cord length is 1.3ft/40cm long and an extension cord of 2.6ft/80cm is included in the package. The product is Avantree TR509, IPX7 waterproof earbuds. They are perfect for swimming because of the waterproof diaphragm protection. Enjoy the cd sound, good high moderate bass. The cable length is 80cm, sensitivity 109±3dB, power 5mW. Others are speaker size 8.6mm, Impedance 32Ω±15%. You get the Avantree TR509 with spare ear tips. 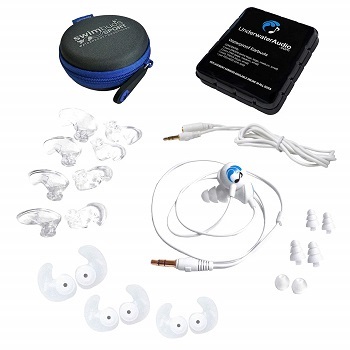 The earphones is compatible with many device with 3.5 mm audio jack and mp3 players. Others are smartphones, iPad, iPod iPhone and tablets. Accumulated water in earbuds decrees volume. Shake out excess water and allow to dry. Use earphone not more than 45 minutes each time in water. According to their promo the headphones are designed for flip turns!, hundred percent waterproof the flanged ear buds create a tight seal. Designed to IPX8 standard they have extra short cord and waterproof extension cord. Find a custom fit while you listen to uninterrupted listening, impressive sound quality. They have included swimbud sport, swimbud flex and hydroactive. Hydrpflex provides sturdy wrap-around band, swimbuds flex for secure fit. 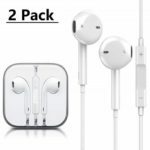 Item weight 2.4 ounces, headphone fit in-ear, additional features include waterproof technology, 1 extension cord. Good underwater headphones but durability suspect. With this product you get two for the price of one. 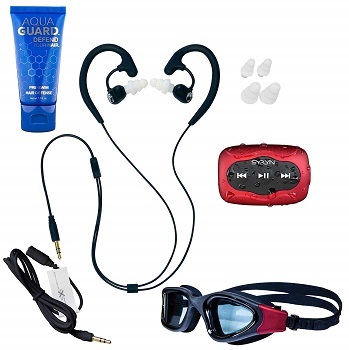 The package includes the swimbuds fit waterproof headphones and GB SYRYN waterproof MP3 player. The headphones and MP3 player are completely waterproof. The SYRYN player has 7 hours battery life with 8 GB memory. The long battery life encourages longer swim and better leisure activity. You get 3 sizes of soft tree shaped earbud tips for more choices and better fit. You will also like the un-obstructive short cord, ergonomic design and moldable memory wire. The manufacturers have included a free extension cord, 1 oz. bottle of AquaGuard in-Hair swim defense. The product comes with 1 year warranty. The package comes with swimbuds fit headphones, 17 inch short cord, memory wire. You get 39 inch extension cord, a free 1 oz bottle of AquaGuard pre swim in hair defense and a USB 3,5mm cable for charging/syncing. Others include small, large, medium sized tree-style earbuds for better waterproof seal inside ears. Item weight is 0.64 ounces uses 1 lithium polymer battery with power source corded-electric. The SYRYN player is certified IPX8 with submersion depth of 10ft. It has 8 G memory can accommodate 2000 songs with option shuffle feature. No drivers required just plug and play. Headphones compatible with windows system, Mac while SYRYN player WMA audio formats, MP3. The MP3 Player that comes with the headphones are fully submersible. They are durable, designed for long periods swimming. The player has built-in 10 hour battery, multiple format playback, drop/ drag iTunes for mac or windows. You get 3 pairs active sports earbuds, 2 pair’s water blocking earbuds. They are certified IPX8 have flexible wrap-around style. Features include easy drag/drop audio file management with durable waterproof construction. Others are 4GB, 100mp3, simple touch button control on earphone without touching mp3 player. It has built-in 4GB flash memory and made with flexible material. The submersible waterproof construction makes it perfectly designed for swimming, exercise and fitness activity. The frequency response 20Hz-20kHz, Lithium battery 200mAh. Speaker type NdFeB, 9mm, digital audio file Mp3, WMA. The marine grade is IPX8 water rating, battery charge time 2 hours, battery life 10 hours. The have included USB high speed data transfer technology with speaker rate power at 5mW. It does the job well however doesn’t hold a charge. The earphones dislodge easy underwater and water pressure reduces the audio.